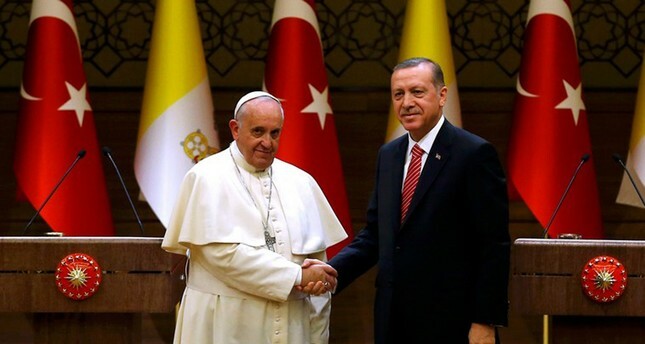 President Recep Tayyip Erdoğan and Pope Francis in Ankara, Nov. 28, 2014. The United States' controversial recognition of Jerusalem as the capital of Israel is expected to dominate talks between President Recep Tayyip Erdoğan and Pope Francis on the president's first trip to the Vatican on Sunday. According to presidential sources, Erdoğan will thank Pope Francis for his stance against U.S. President Donald Trump's decision and his efforts to protect the status quo in the holy city. The Turkish president previously expressed his appreciation to Pope Francis who strongly opposed the bitterly-contested move announced by Trump at the end of last year. The two leaders held several phone calls regarding the issue and voiced their determination to follow developments regarding Jerusalem. The current humanitarian crisis in Syria, regional developments, terror, cooperation against Islamophobia and xenophobia are also among the topics which the two leaders are set to discuss during their meeting. The Argentine pope met Erdoğan during his trip to Turkey in November 2014 as the first world leader to visit the Turkish presidential complex in Ankara. The return visit will be the first by a Turkish president since 1959. Francis has repeatedly praised Turkey's efforts to welcome Syrian refugees and has said the country could be a "great peacemaker." Erdoğan will also meet Italian President Sergio Matarella and Prime Minister Paolo Gentiloni in Rome to discuss cooperation in various areas, including politics, the economy, and the defense industry. "Our strategic partner and ally Italy, with whom we enjoy excellent relations, is also one of our leading economic partners. President Erdoğan is also expected to receive executives from leading Italian firms during his visit to Rome," a statement from the president's office said.